Since 1 April 2005, named general director of Zentiva CZ.What persuaded you to accept the offer of this position? I see leading Zentiva’s commercial unit on the domestic market as a great honor, so the decision was simple. What do you consider your main task? Successfully planning and applying the firm’s strategy in the area of the Czech Republic’s primary health care system. Our mission is to increase the availability of high-quality medications for all patients. As a domestic producer, Zentiva plays a decisive role in this process by law. What do you think a general director’s most important strength should be? The strength of any manager is faith in the team of his subordinates, the ability to build a high-quality team. If you can put together a team of colleagues who are stronger than you are in many ways, it improves the quality of the whole team. Teacher, chimney-sweep – and in my later school years, I was enchanted by the work of the head of our village pharmacy. I wanted to become a pharmacist, and my dream came true. A combination of leadership and facilitation of a team dynamic. I like teamwork, and in private I like to laugh, even though I may not look it. Tenacious, open to the opinions of others, goal-oriented (in my wife’s words). As of 23 March 2005, appointed general director of Volvo Auto Czech. Since 1 March 2005, new general director of Contactel. 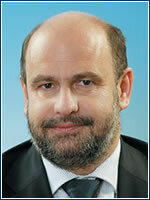 On 1 April, named general director of Electroworld central Europe.